Dodger Stadium is where the majors went modern. The collaboration between team owner Walter O’Malley and architect Emil Praeger resulted in a positively futuristic sports venue when it opened in 1962. The 56,000-seat stadium is baseball’s largest, and also the third oldest—which is remarkable when you think about L.A.’s rep for ditching the old in favor of the new. In a stadium where heavy, moist air typically limits how far fly balls carry, Game 1 of the 2017 World Series was the exception. Temperatures in Dodger Stadium reached an all-time World Series high of 103. It was a dry heat. And all four runs were scored on home runs—including a 447-foot shot by Chris Taylor, the longest of his career. Even under normal conditions, Dodger Stadium isn’t as pitcher-friendly as it once was. The addition of the premium Dugout and Baseline levels has vastly shrunk foul territory. More foul balls reach the stands (the Field Level from sections 18 through 28 is a prime spot for ball hawks), so batters get second (or third) chances they never had before. Home runs have cleared the pavilion’s zigzag folded metal roof just five times, and only once by a Dodger (Mike Piazza). 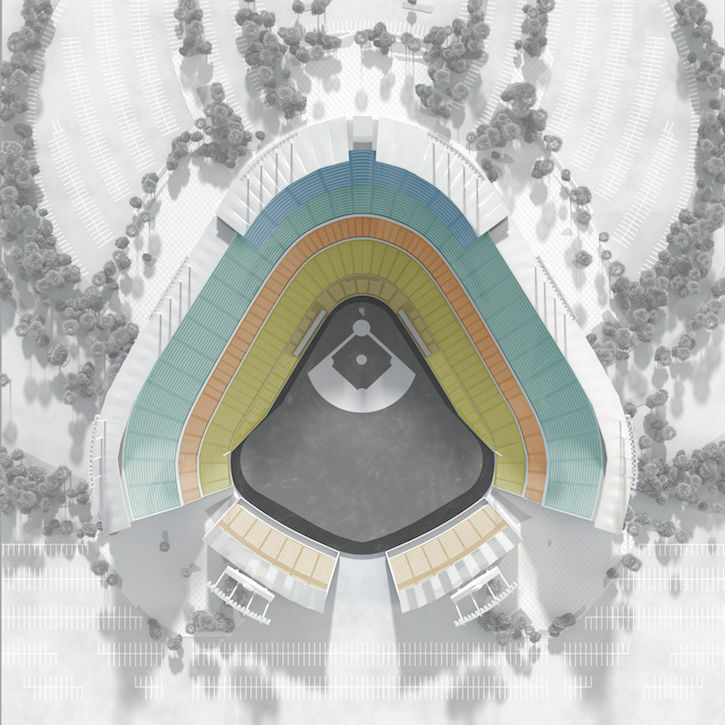 The roof and the entire pavilion section could have been lost if the team had increased seating by enclosing the stadium—once a possibility. Poured on-site, the top deck’s parabolic concrete roof is another classic 1960s form. After dark, recently installed fixtures mounted to the deck’s columns shine light upward to simulate the glow from the setting sun as it illuminates the underside of the roof. After the surrounding hillsides were denuded during stadium construction, the team began planting the now-mature forest on the slopes nearest the parking lots. 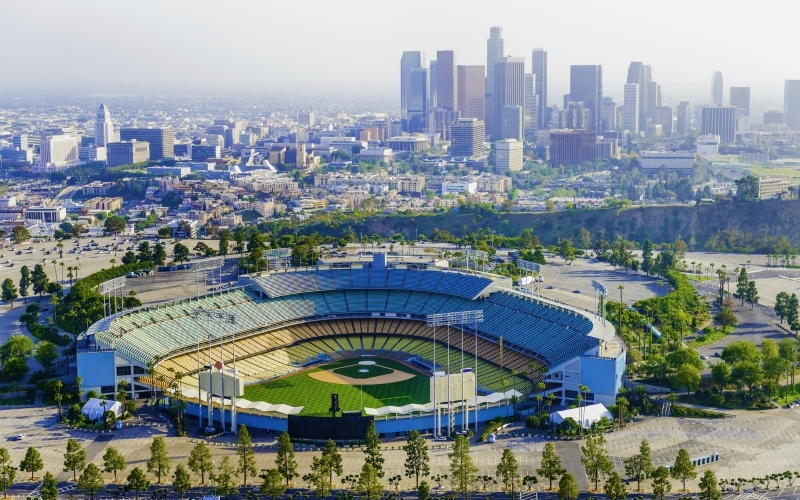 The Dodgers are the only team in Major League Baseball to employ a full-time arborist, and in the past five years alone, the club has added more than 100 trees to the grounds closer to the stadium. The colorful palette of drought-tolerant plants is a recent addition, too, while the palms beyond the bullpen—among 500 total—have become L.A. icons. Even after more than $150 million in renovations since 2013 (vaya con dios, trough urinals), many vintage Dodger Stadium features survive. That includes the spartan press box and some of the martini glass-shaped planters. Along the club level in left field, original stadium seats were refurbished and reinstalled; they’re now used primarily by players’ friends and family. And new directional signs along outside staircases and escalators follow sketches found in Walter O’Malley’s files and echo the hexagonal scoreboard design. The historic seating color scheme, from the yellow-gold of the field boxes to the sky-blue top level, is designed to suggest the gradation of colors as the setting sun reflects o the ocean. While Dodger Stadium has perhaps the best sight lines in all of baseball, the pricey Dugout Level gets fans closest to the field but also reduces perspective on the outfield. In contrast, upper levels get you nearer to the action than they do at most stadiums because of the stadium’s cantilevered design (a relatively shallow field section also helps). Many fans swear by the Loge—the third level from the field—as the perfect compromise among price, proximity, and panoramas.